Please join artist Kate Iverson during Art-A-Whirl weekend for an exclusive pop-up exhibit of her work at her new studio in the 1101 Building. Enjoy live art demos, special guest artists, complimentary snacks from Tomodachi, art activities for both kids and adults as well as other open artist studios throughout the building. Semblance of Disorder is a selection of works created by Kate Iverson throughout 2016-2017. Ranging from pieces on canvas and panel to framed and loose works on paper, Kate’s artwork often crosses mediums such as tempera, watercolor, acrylic, ink, Japanese washi tape and more. Pieces in the exhibit include vibrant, shape-driven works inspired by contemporary design and randomized structure, with color palettes influenced by international fashion color stories. Other works embrace a more stark, minimalist approach, with strong lines juxtaposed by soft abstraction via black and white works on paper. 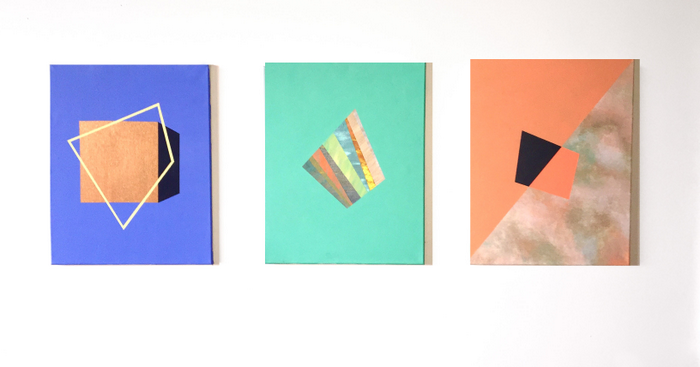 Though Iverson’s palettes often contrast per collection, her distinctive, design-minded aesthetic and sense of abstract geometry are fluent throughout her work. Kate Iverson is a mixed media artist and painter living and working in Minneapolis, MN. She has exhibited her work locally and nationally, at spaces such as The Soap Factory, SooVAC, CO Exhibitions and more. She’s received a number of awards and accolades for her work in arts, media and leadership, and was awarded a Tofte Lake Center artist residency through the Jerome Foundation in 2014. She is also co-founder and current board chair of award-winning art space, Public Functionary. Focusing on the parallels between order and chaos, nature and design, Kate’s work often mixes a variety of mediums and techniques.